Are you buying ‘organic’ produce? The organic movement is a deceptive beast. There, I said it. And if it’s going somewhere, it’s straight into your wallet and the depths of your heart, into that sweet spot called ‘fear’. And before I’m voted off Planet Responsible Citizen, and I expect you’re angry with me at this point, I’ll explain. It’s not in my nature to be the skeptic, especially with matters of health. I, like you, want to give my family and anyone who sits at my table, a nutritious meal, and hopefully one that won’t obliterate their chances of spawning genius progeny by modifying their genes with added chemicals and man-made bad stuff. In fact just the thought of giving them heartburn makes me sad. Occasionally my dinner mates end up with a highly calorific meal, but that’s because love can be scientifically measured in butter and cream. Just ask Julia Child. The produce aisle in supermarkets, which is where most of us shop for our food in South Africa is littered with signage signaling that you can do better. For R 5 more you can ensure the baby marrows you add to the kids’ pasta are better for their health and well-being. They are even wonky in shape to prove the point that they haven’t been forced to conform to standard farming practice. That R 5 makes you a responsible human, one who cares for your family and the planet. What the supermarket hasn’t told you is that not all organic farms use zero pesticides and just because it’s natural does not mean it’s non-toxic, or safe. And, all those R 5s add up. I often find myself wringing my hands with indecision, a case of ‘produce paralysis’, fully aware that the parking bill is rising in direct proportion to my indecision. By now you’re demanding I quote references to the bad science I’m using to back up my views. What I’m saying is that the consumer needs, deserves in fact, to be educated about what organic really means, and more than that, what constitutes safe produce. 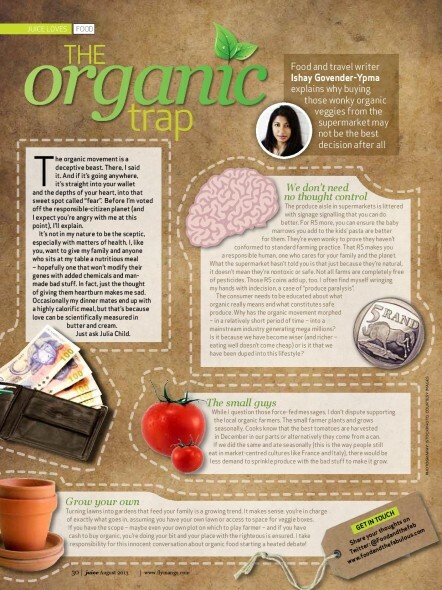 Why has the organic movement morphed in a relatively short period from a lady in a torn knitted jumper at the local market selling tubers and sprouts to a wholly mainstream industry generating mega-millions? Is it because we have all become wiser (and richer – goodness knows eating healthy sure don’t come cheap) or is it that we have been duped into this lifestyle? While I question those force-fed messages, I don’t dispute supporting the small local organic farmers. The small farmer plants and grows seasonally. If he is the type of guy selling at your local market, he knows he’ll be skewered if he doesn’t. He or his assistants are there to answer your questions and meet your eye. Cooks know that the best tomatoes are harvested in December in our parts, or alternatively come from a can. And if you don’t, I suggest you google a seasonal produce calendar. If we all ate seasonally, and incidentally this is the way people still eat in market-centred cultures like France and Italy, there would be less demand to sprinkle out of season produce with the bad stuff to make it grow faster or bigger. Turning lawns into gardens that feed your own family is a growing trend. It makes sense, as you are in charge of what goes in, exactly. This is assuming you have your own lawn or access to space for veggie boxes. Again, in promoting this self-sufficient, health-obsessed culture we alienate and further separate rich from poor. If you have the space, maybe even your own plot to play farmer, if you have cash to buy organic, you’re doing your bit and your place with the righteous is ensured. I take full responsibility for an innocent conversation about organic food opening up a can of worms. Meanwhile, I will continue to trawl the aisles, wringing my hands, shaking my head and dreaming about a garden where I wear floral wellingtons and grow-my-own, smugly. this post wins! I’ve seen many friends obsessing over where their food comes from, always looking for labels like “free-range”, “organic” and “fair trade”, all the while casting sidelong glances of contempt at others who don’t. it’s funny and irritating and sad at the same time. we all want good, clean, sustainable food but like you said, labels often don’t reveal the whole truth. here at home, we try to grow our own herbs and vegetables. it’s not that easy and you can only grow so much in a small space! but we can give ourselves pats on the back for our effort while driving to our weekend market 🙂 local farmers are just like grocers — some are more trustworthy than others. Ishay, I’m always very skeptical about anything “organic”. How can you grow organic produce in a world where not a raindrop is “organic” and all of them have some pollutants. I am not promoting homeopathy (another bogus) and the water molecule memory, but unless you grow food off distilled water (and no matter what carnivorous people say, you need greens to feed herbivores to feed them) in the middle of the Sahara desert. I don’t see how you can keep it really organic all the way to your plate. A different think is to talk about corporate foods. Business only goal is profit, THEIR profit. Food artisans goal is their art, in this case, food. Always pick a food artisan who will get mad at you if you dislike his jams, cheese or wine over a factory-made cookie or drink born out of the search for the “food” (i.e. bread) that technically matches the specifications at the lowest possible cost. I’d say buy organic-est, don’t get obsessed with the impossible chimera of organic food. I couldn’t agree more. A women I worked with used to work at rainbow chicken and said, she’d be more worried about the chemicals they use to feather and clean the chickens than them being organic. If someone has seen a farm chicken after it is plucked, it isn’t smooth and cream coloured – so why pay R40/kg more for a label. Do you know how unethical the farming is at Rainbow Chicken? Its disgusting! And, inhumane, conditions are appalling. Visit Farmer Angus at Spier and know the difference! I hear you, and this may be so, the animals are treated unethically. What do we say when our helpers and staff can barely afford meat and chicken and a label means nothing? The price is going to dictate consumption. This is a reality that those of us who can afford to put more or less what we like into that trolley must take heed of. I refer you to point 4 in my reply to Jodi below. For what it’s worth, my folks probably still buy battery farm chicken. When we were young they had access to proper free-range farm chooks. Times have changed, money talks in this game. I’m not saying it’s right and that we should stop educating people about the practices and the consequences of our actions. When food has to be put on a table, organic, local, ethical remain a conversation for the elite. Thanks for writing Rosemary! I hear you. I have stopped buying all but one brand. I know the chooks are treated well but more than that it just tastes better, there’s no shrinkage and I found a variety of a pieces at a very good price not so long ago. Stocked up. Other times I just go without – it’s a huge balancing act this. Many of the organic/free range etc terms are vague and it is impossible to really know which is real and which is a marketing gimmick. And yes buying organic from a retailer is a luxury item when it comes to the cost. Support the small local producer and grow your own. My two veggie boxes deliver a fresh supply of seasonal herbs, chillies and leaves right through the year – enough to sometimes share with friends. PS “because love can be scientifically measured in butter and cream” will be my next Someone Once Told Me! I would love to be the receiver of some of those herbs! Yes, butter and cream, universal solvents? 😉 Not quite, but very very necessary…. Great post Ishay. One thing you didn’t touch on is the prohibitive cost of organic certification. This is another reason to buy from local small producers, who often allow you to visit their farms so you can see for yourself how they grow their produce. Just because something isn’t labelled organic doesn’t mean it wasn’t grown using methods you’d prefer. Thanks Nicola. I didn’t touch on it as there was so much to cover within confines of 700 words. But, it is something very valid to keep in mind. Thanks for sharing. See my reply to Jodi below for more information. I think you are so right, Ishay! I grow my own herbs and some veggies – at the moment I have lettuce and wanted to grow peas, but the pea plants were all eaten up by something! I would like to know how the organic growers are keeping the peaplant-eaters at bay? If you can afford ORGANIC, great! However, there is zero chance of producing organic food for all the people on earth. ZERO. Organic is only for the rich. We need mass produced foods to feed 95% of the population. If we all try to eat organic, we will die. Isn’t that a depressing thought. I’m not certain on the figures there but suspect you may be correct. We echo the same sentiments in this regard Anique – I mention supporting small growers, asking questions and growing your own if you can + spreading the word in the community. Thanks and meeting you would be nice. I think perhaps this blog has been posted without doing much research – as it appears to be a tad naïve. Please feel free to do more research (herewith a few links) whereby you can find out more about the company called Monsanto who is systematically attempting to monopolize the food industry. They are responsible for the widely used herbicide “Roundup” made from Glyphosate which causes MANY health issues. Not to mention the effects that it has on the ecosystem (bees, pollination etc.) This is the same company which brought the world “Agent Orange”. Furthermore, they are responsible for GMO’s. Nothing wrong with genetically modified organisms you might think, but wait – there is more. They are in the process of patenting the DNA of the gmo’s, therefore if cross pollination occurs between farmers fields who grow organic, that farmer may be sued because his plants now contain that DNA. By buying organic, you are ultimately showing this organization the finger. We can put a stop to it by killing the demand for GMO’s and pesticide/herbicide infested food. I’m so glad you’ve brought this up. Your passion and interest shows through, and we need this kind of active-thought in the way we approach food. 3. We falsely equate organic with ethical and healthy. Refer again to the sparky piece above that puts the assumptions of better health, better for the environment to task. As Anique from Ethical Co op mentioned on twitter- how are the farm workers being treated? This concerns me. Greatly. Maybe, if pushed I’ll shorten my lifespan by eating food known to be GM, if it means labour practice is fair. We all have our causes and our tipping points. Humans first in my case. And as we all know: the general population will never know about the lives of those growing their food. Will they? 4. Let’s linger on the issue of the general population a second. This year the number of people starving world-wide, is now sitting at 1 billion or roughly 1/7th of the population. Where do they fit in when we’re discussing ethics, big industry and courgettes for fritters. And does it matter? I tell you what does matter in the case of hunger: food. I don’t support an opportunistic industry that preys on food security. But if someone will explain to me how we’re all going to get to ‘food utopia’ at the same time, I’d be joyous. Our only solution as we’re doing ‘our best for our families’ is to forge a huge chasm between rich and poor, well-fed and starving. We do it without blinking – just visit a so-called South African food market. We do not have a proper food market culture that caters to average people to buy great produce from farmers and merchants at super prices as they do in Italy and France, for example. We have places that sell steak sarmies made with ethical meat, craft beer and a side of smug. I’m grateful there’s a place for artisans, in fact I often take guests to these markets. But my heart is shredded each and every time. 5. What I do suggest, is that in asking, in starting a conversation with your circle, you may discover there is a farmer locally (carbon miles, hello) selling a small variety of produce. Speak to him. Here’s a human, he grows the stuff. He’s sure to have a view on this, after all it is him, not us up against the big guys, carrying all the risk. Support small growers where you can. This is logic. Plus, he’s probably cheaper that the supermarket that’s stuffed the wonky-enough veggies into pretty packaging for you to walk off with, guilt-free. 6. I suggest growing your own. But, again with point 4 above- if you are growing your own and putting nothing back into the community, even if it means a conversation held with your circle, what’s the point in the greater scheme of things? That would bring us back to the righteous and the rich. And so the cycle starts again. Lastly, this diagram could be useful to all of us:http://visual.ly/organic-vs-gmo-foods – should put it in the body.